NE 205th Street is closed between 33rd Ave NE and 35th Ave NE due to a sinkhole caused by a broken water main. This is the county line and Mountlake Terrace has jurisdiction - at least over the water main. Their public works department is on scene. LFP advises that this will likely be a long closure so please plan on using an alternate route. This may have been a long-standing problem. A resident reported that "Water has been leaking out of the street in that spot since I was a kid. We would slide down it in the winter when it would freeze." The break is on NE 205th between 45th where the green park ends and 37th. All the streets have two names - one in each county. 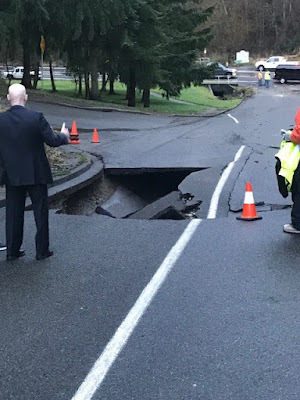 So this sinkhole is actually on 244th St SW in Mountlake Terrace and the second one (see article) is on NE 205th in Shoreline. 37th Ave NE becomes Cedar Way as it crosses 205th/244th.